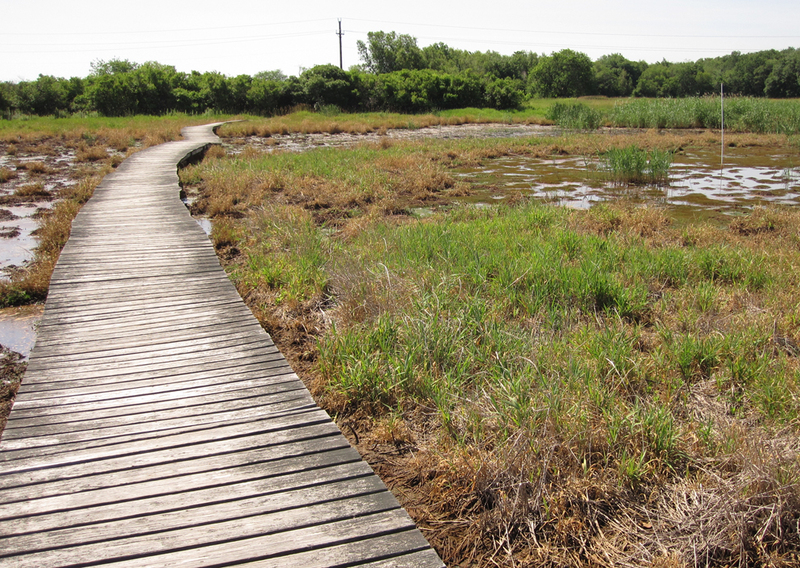 Posted on October 7, 2016 by Barry V.
Daniel Webster Wildlife Sanctuary in Marshfield is truly a ‘Kingdom of Grass’ – acres and acres of it in all varieties, textures and colors. 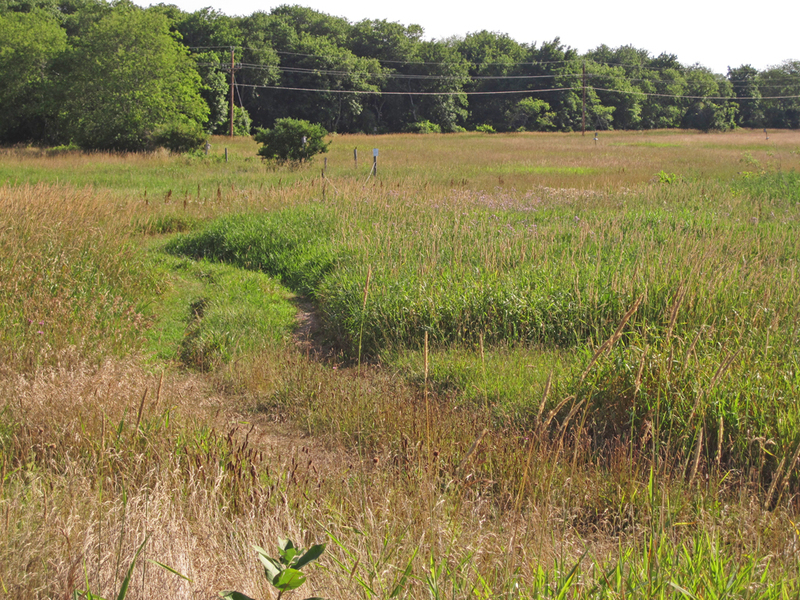 It’s a little piece of midwest prairie plunked down here in the Massachusetts coastal plain. At the head of the Fox Hill Trail I’m surrounded by a rollicking flock of goldfinches, attracted to the ripe seed heads of knapweed. The bright purple blossoms paired with the lemon yellow birds makes for pure EYE CANDY, and I’m struck by the way the morning light rakes over the bird, casting most of the head in shadow. 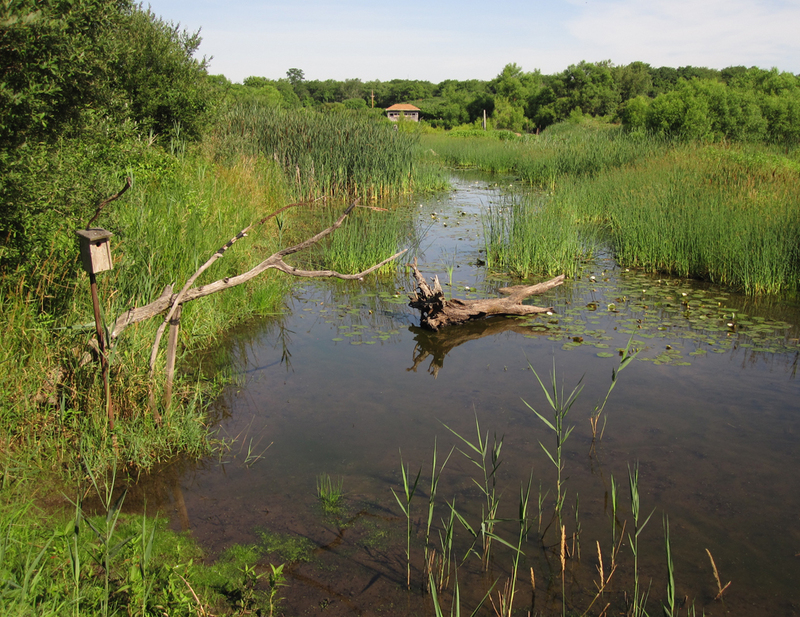 Purple martins fill the air as I branch off onto the Pond Loop. This colony appears to be doing well. I see adults and young birds perched on the sumacs near the ‘gourd colony’. 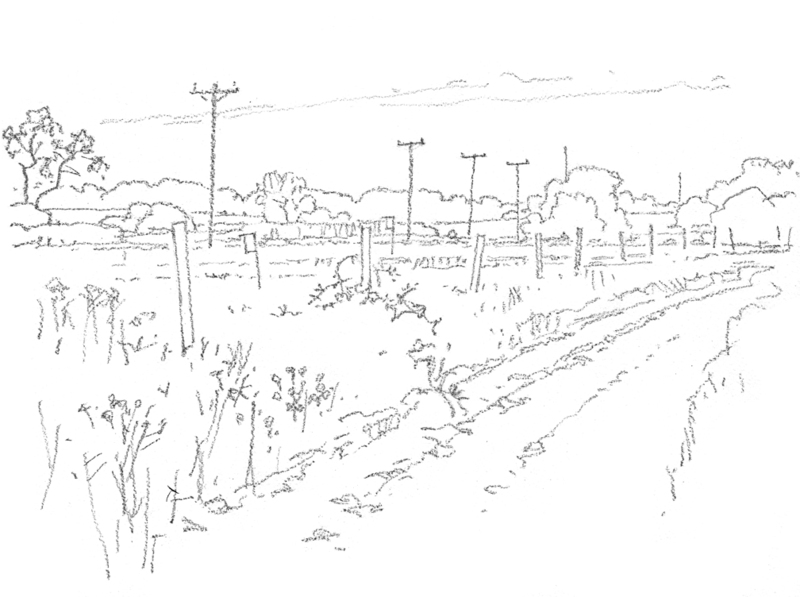 Near the far end of the Pond Loop I pause in the shade before venturing out into the fields. The day is warming quickly, the skies clear and sunny. There won’t be much shade once I emerge from the woods. At the edge of the path, I notice an unfamiliar plant – a few tiny, pink blossoms on a tall, grass-like stalk, each blossom attached to the top of a swollen pod or calyx. 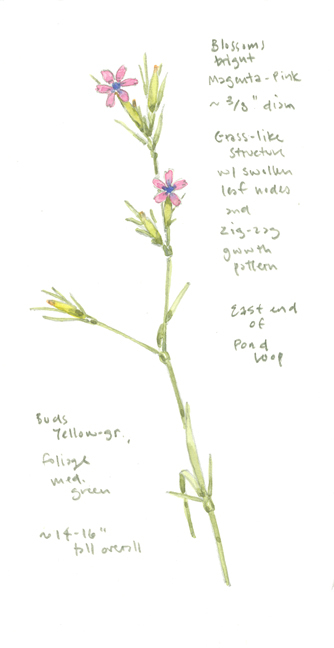 I make a simple study in my sketchbook and a friend later identifies the plant as Deptford pink – an introduced species in the genus Dianthus. 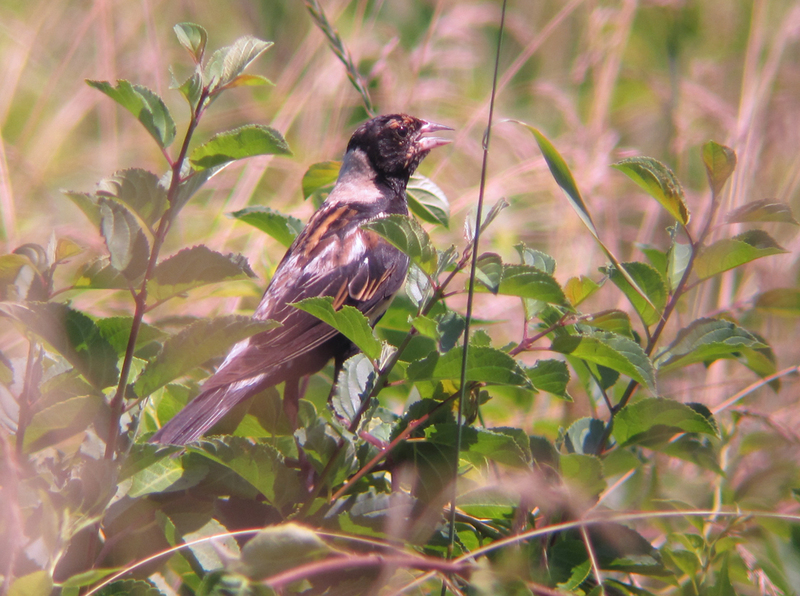 Bobolinks are jinking around in the fields. 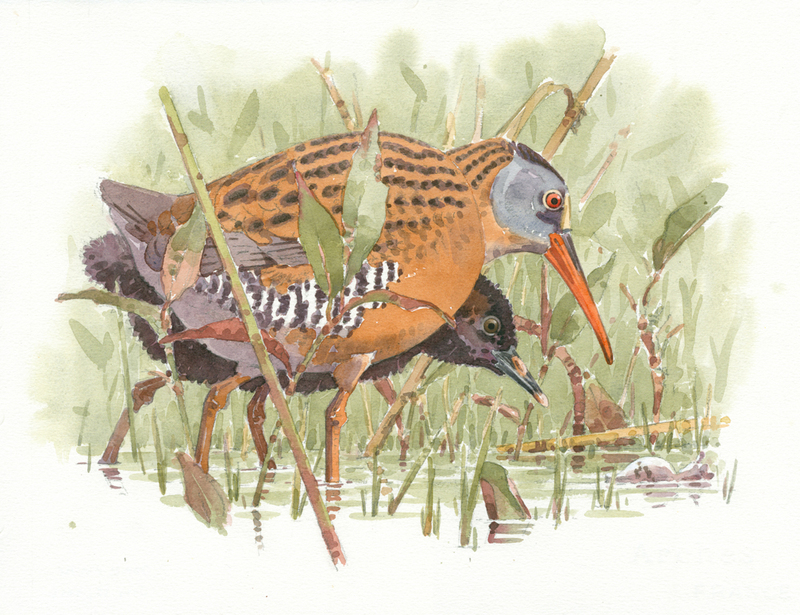 The nesting season is winding down for them, and the males are in an unfamiliar transitional plumage, with brown napes and chestnut splotches on the head and chest. I stroll the River Walk (the GREEN Harbor River an opaque BROWN at this time of year) and pause on the boardwalk where the walk rejoins the Fox Hill Trail. There is a shallow panne here next to the river, with lumps of mud and algae rising above little pools of water. Killdeer are making a racket off to my left, and a snowy egret patrols an open channel. 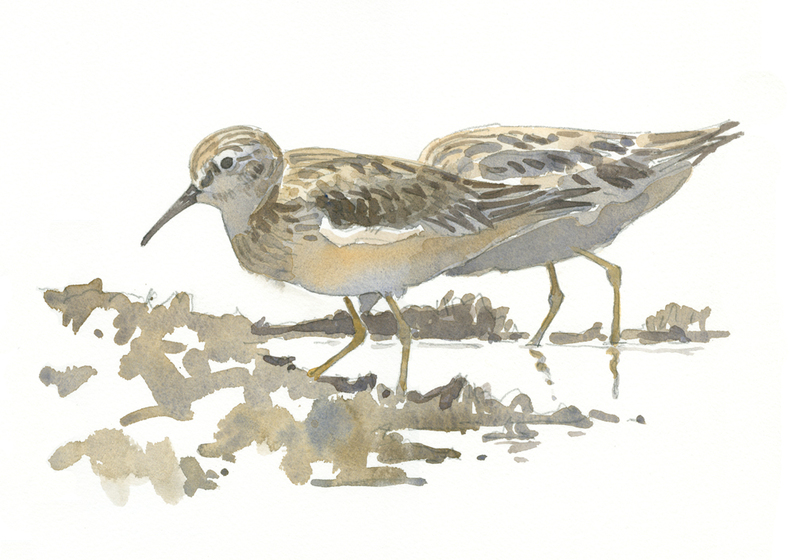 A small flock of peeps sweeps in and lands – seven or eight least sandpipers. 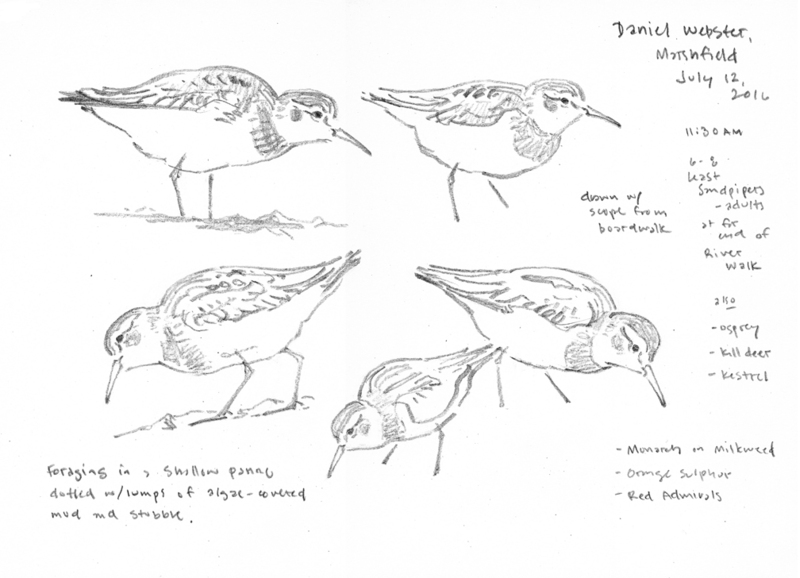 Sandpipers are one of my favorite groups of birds and I welcome any chance to work with them. These peeps are feeding actively, but I build up a series of poses in my sketchbook, working back and forth between the various poses. Heading back along the Fox Hill Trail, I like the view back towards Fox Hill. What attracts me most are the converging lines of perspective – a row of telephone poles in the rear, another parallel line of fence posts in the middle distance, and the wide track of the Fox Hill Trail – all converging on a point just out of the picture on the right. From this vantage there is virtually no shade, and the afternoon heat is relentless. I take out a sheet of cold-press watercolor paper and do a drawing, but decide to add the color later in my studio. Cold-press is not as nice to draw on as hot-press, and in the dry heat, the surface feels like sandpaper under the tip of my 3B pencil. 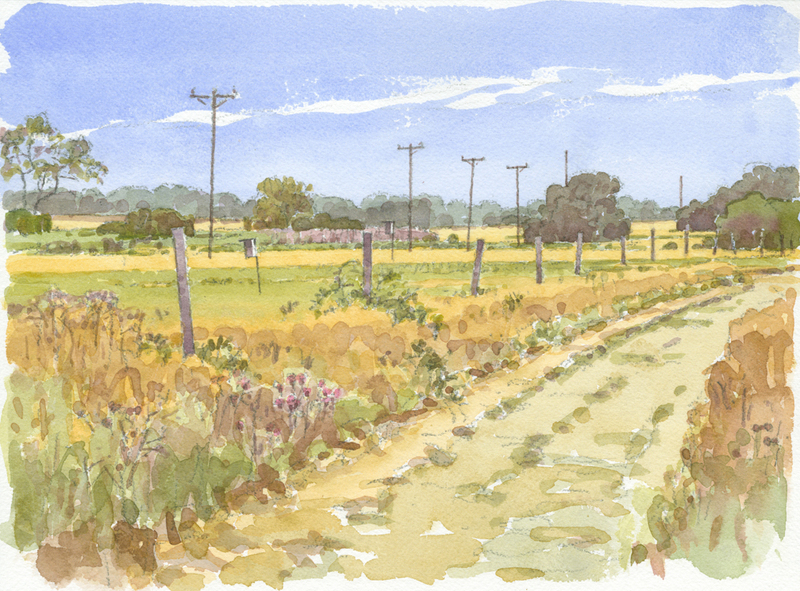 Aside from exaggerating the colors in the ripe grasses, I make one other change to the scene – I move the crossbars on the telephone poles to the tops of the poles. Perhaps it’s my nostalgic side, but this is the way telephone poles always looked when I was growing up, and it just feels better to me this way. 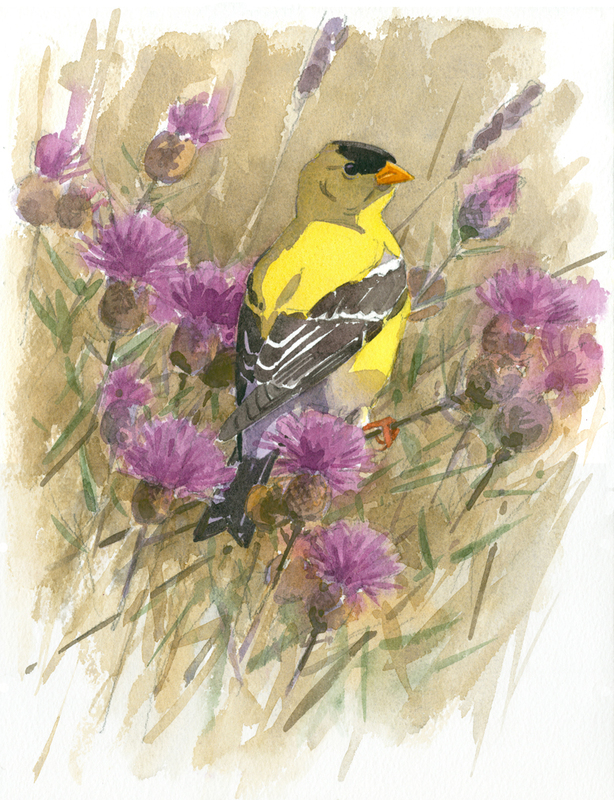 This entry was posted in Art Exhibition, Artists, Barry Van Dusen Residency, News and tagged Barry Van Dusen, Daniel Webster Wildlife Sanctuary, Deptford Pink, Goldfinches, Kingdom of Grass, Least Sandpiper, Mass Audubon, Purple Martins, Virginia rail on October 7, 2016 by Barry V..
really enjoy reading your posts barry. this kingdom of grass looks like a little slice of heaven. thanks!